Drypoint, 9 7/8 x 6 ¾ in. 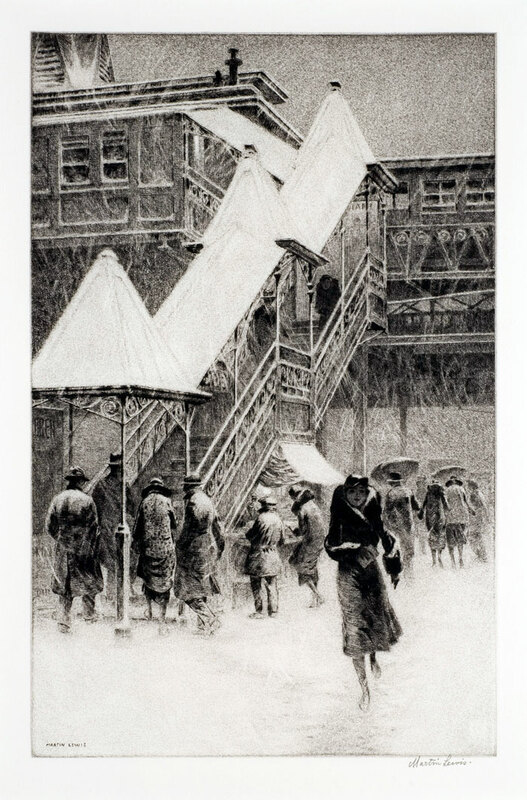 The Bruce Museum in Greenwich, Connecticut, presented the new exhibition The Prints of Martin Lewis: From the Collection of Dr. Dorrance Kelly from October 2, 2011, through February 19, 2012. 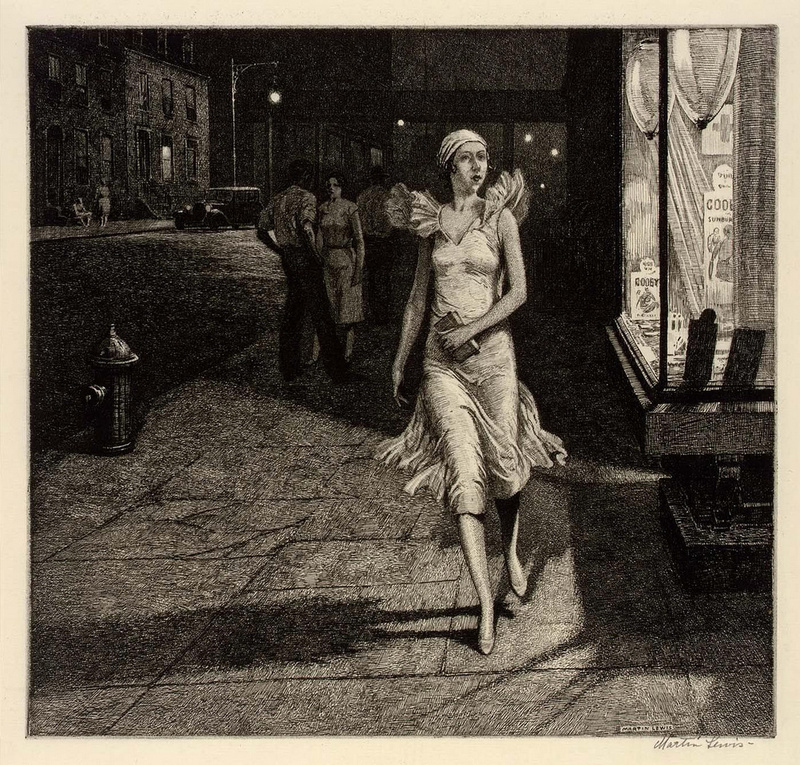 Recognized as one of the premier American printmakers of the first half of the 20th-century, Martin Lewis (1881-1962) left an indelible mark on the landscape of the art world. 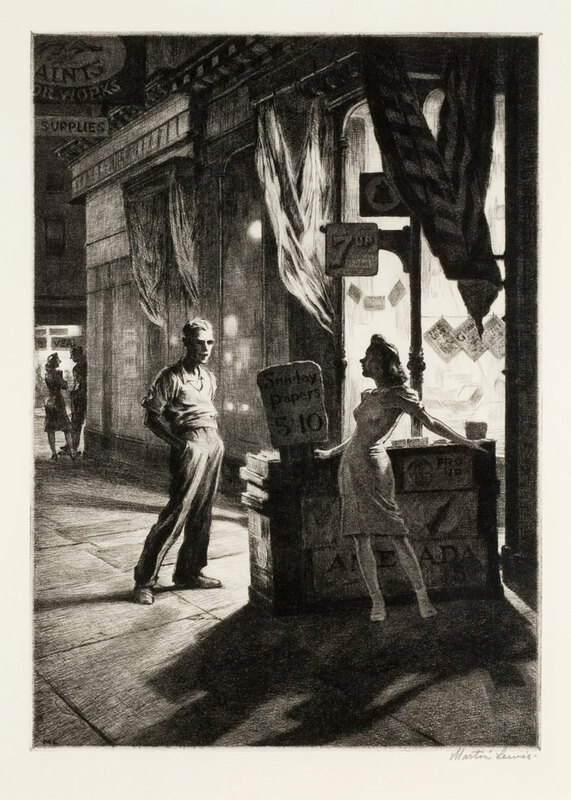 Although not as publicly well known as some of his contemporaries such as Edward Hopper, Lewis was a highly skilled printer who was greatly involved in the artistic scene of New York City during the 1920s and ‘30s. This exhibition features more than thirty etchings and several canceled plates by the artist from the private collection of Dr. Dorrance Kelly of West Redding, Connecticut. 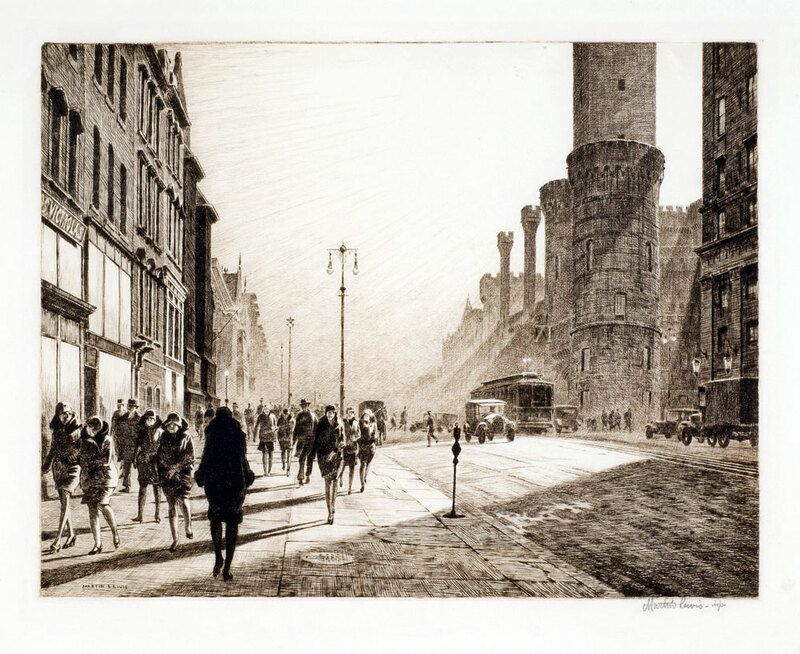 The exhibition The Prints of Martin Lewis: From the Collection of Dr. Dorrance Kelly provided a brief biographical account of Lewis and showcases some of the artist’s best technical prints. 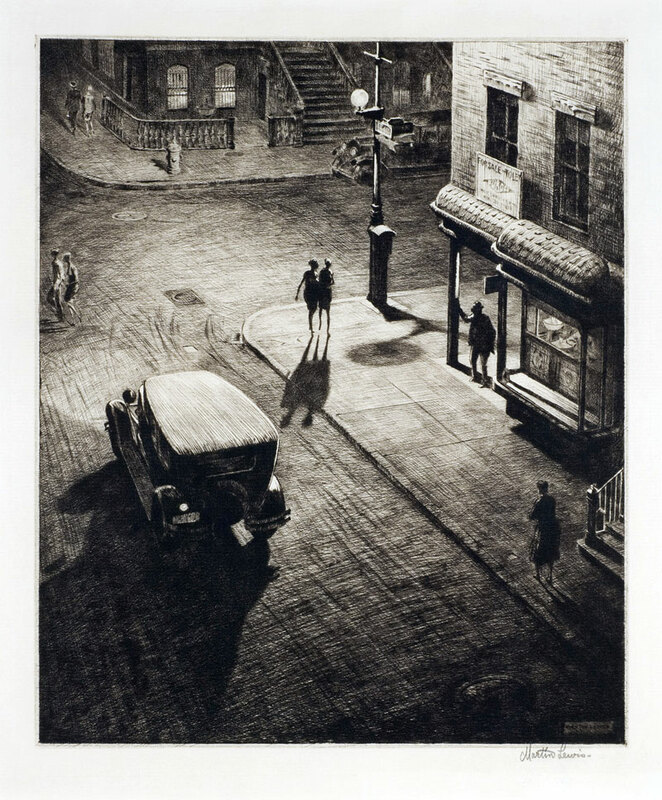 Lewis was an acknowledged master of the intaglio techniques of printmaking, experimenting with multiple processes including etching, aquatint, engraving, mezzotint, and dry point. 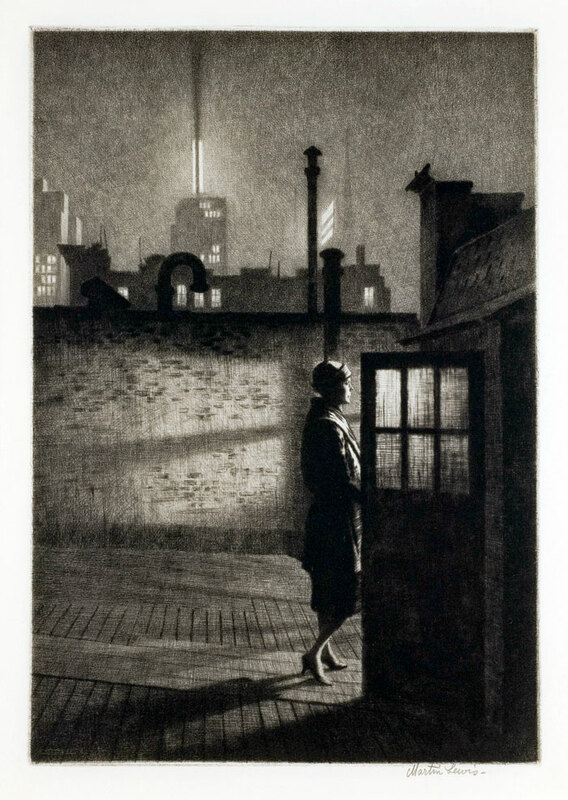 In 1915 he produced his first documented etching, Smoke Pillar, Weehawken. Images like this one documented the scenes of everyday life as they played out in the thriving metropolis around New York City. Lewis portrayed all aspects of city life including dockworkers, skyscrapers, tugboats, and pedestrians – mostly the ladies. 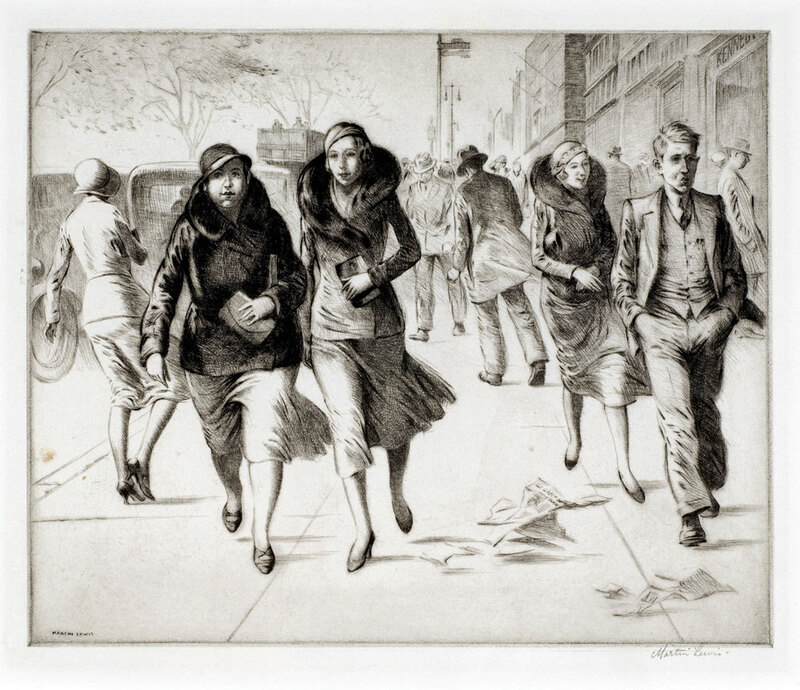 He produced magnificent prints that captured the energy, bustle, and occasional solitude of New York. 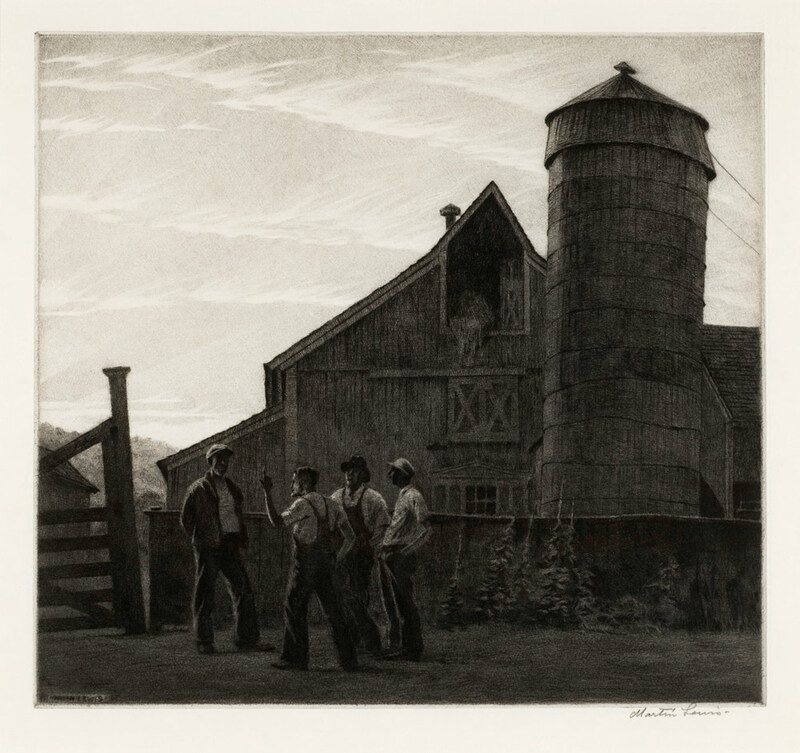 With his move to Connecticut in 1932, Lewis investigated another topic through his printmaking: country life. 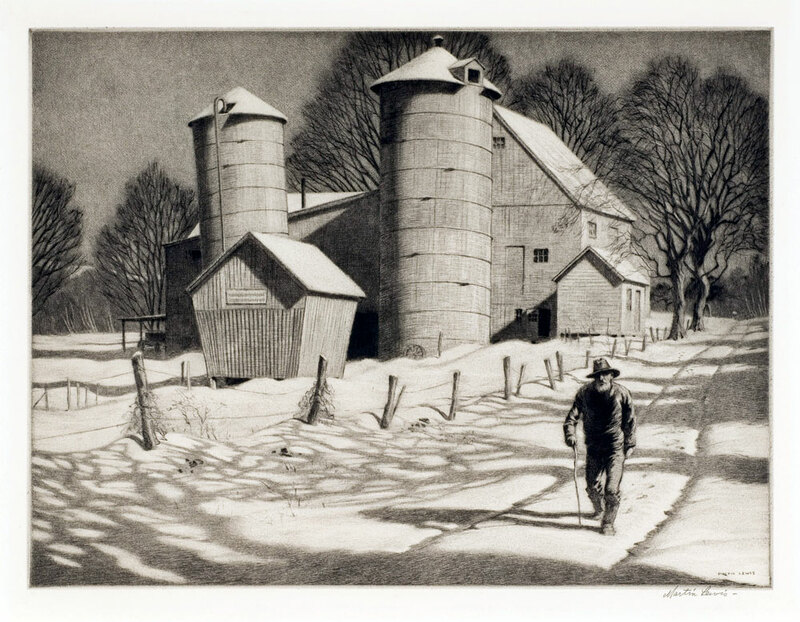 This firmly entrenched Lewis as a prominent American scene artist, as his prints captured the intersection between the urban and rural environments and shed light on the slowly emerging suburban culture. Drypoint and sandpaper ground, 11 ¾ x 7 7/8 in. Drypoint, 9 7/8 x 12 in. Night in New York, 1932. Etching, 8 3/8 x 8 7/8 in. Relics (Speakeasy Corner) , 1928. Drypoint, 11 7/8 x 9 7/8 in. Drypoint, 10 ½ x 7 ½ in. 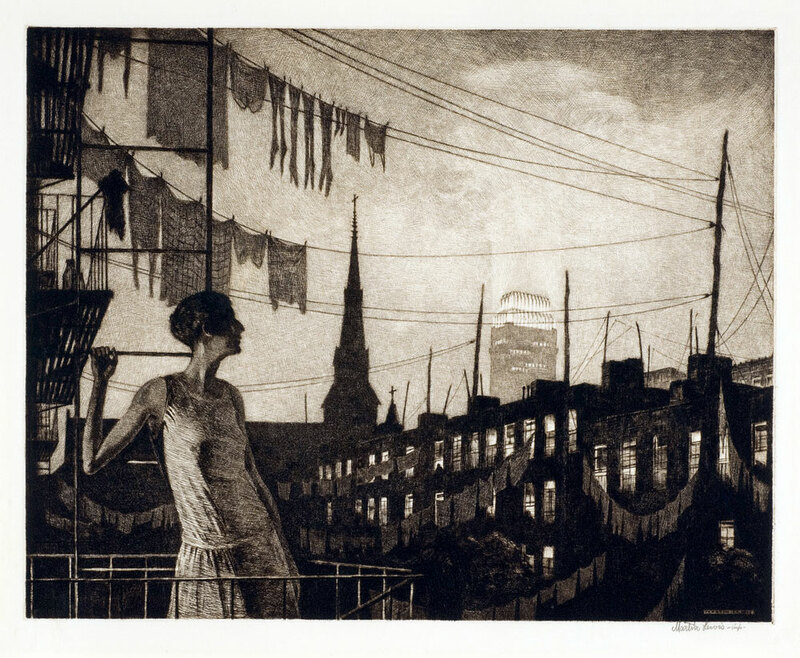 Glow of the City, 1929. Drypoint, 11 ¼ x 14 ¼ in. Drypoint, 9 7/8 x 11 7/8 in. Martin Lewis (Australian, 1881-1962), Politics, 1936. Drypoint and sand ground, 9 ¾ x 10 5/8 in. Drypoint and sandpaper ground, 9 ½ x 10 7/8 in. Drypoint. 9 7/8 x 12 in. 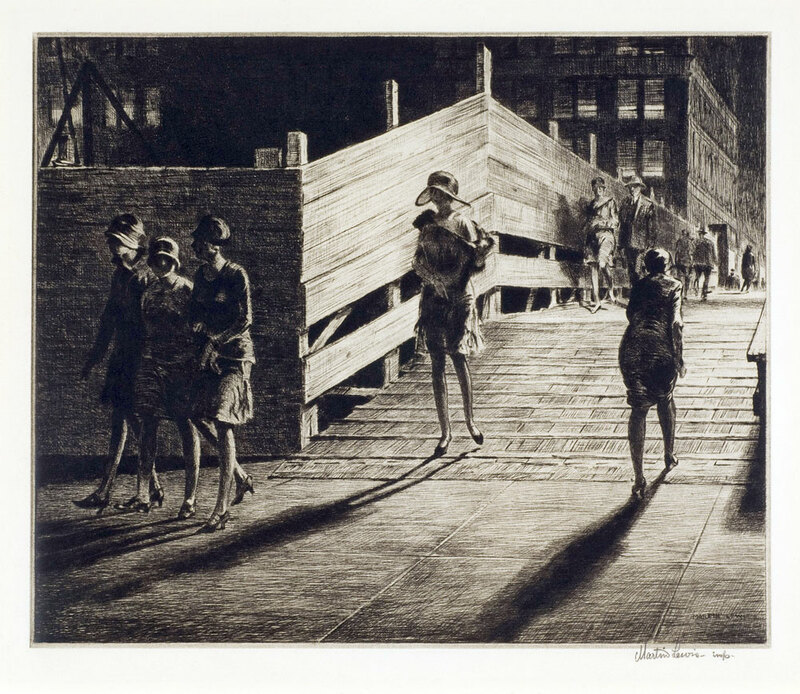 Martin Lewis,(Australian, 1881-1962), Grandpa Takes a Walk, 1935. Drypoint and sand ground, 8 7/8 x 11 ¾ in. Drypoint, 9 7/8 x 12 7/8 in. Snow on the “El”, 1931. Drypoint and sand ground, 14 x 9 in.